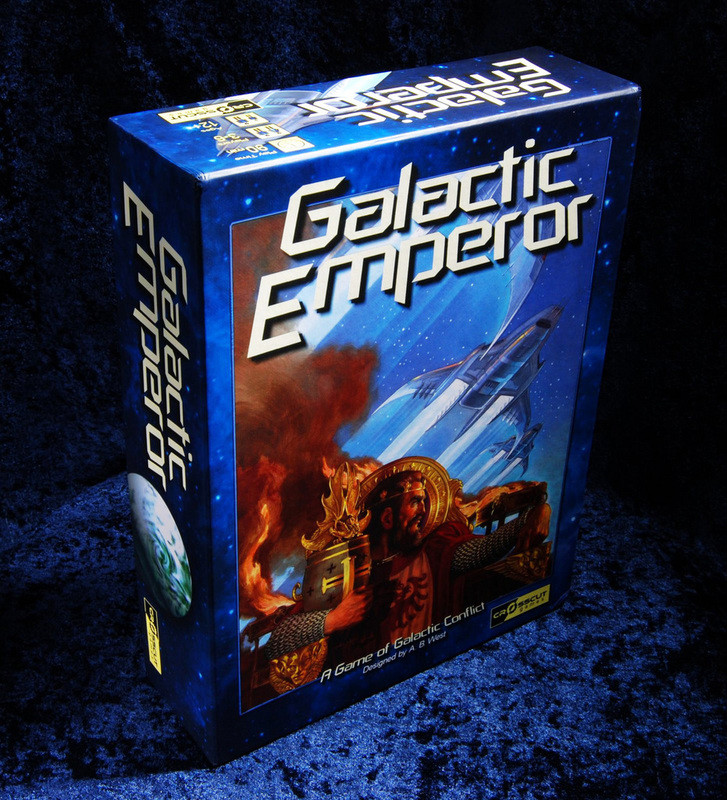 In 2008, CrossCut Games – a company known previously for independently-producing computer games – introduced Galactic Emperor to the boardgaming world, and fans of epic tabletop star sagas fell in love. 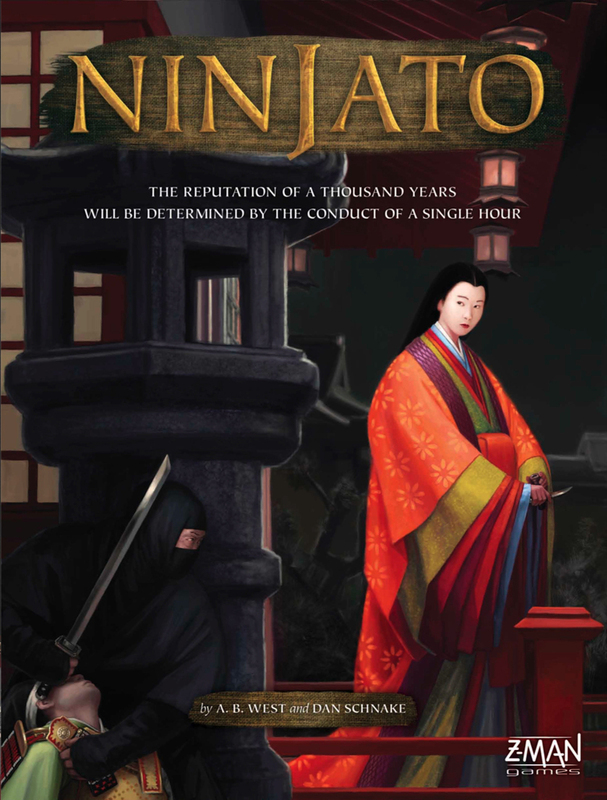 Not content with resting on success, the guys behind CrossCut Games – Adam West and Dan Schnake – are bringing the art of the silent death to tables everywhere with the summer release of Ninjato. After all, when you want to top epic star sagas in coolness, your best bet is to break out the ninjas. For those not familiar with the theme or concepts of Ninjato, can you provide a brief summary of gameplay and mechanics? 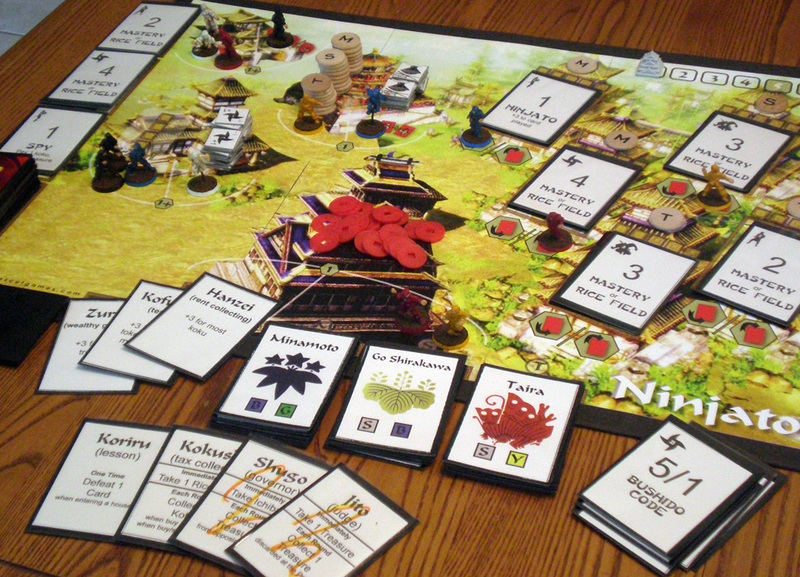 Ninjato is a fast-playing strategy game set in 12th century Japan. This was a time of turmoil primarily between two factions – Minamoto and Taira, and the retired Emperor Go Shirakawa. We’ve injected ninjas into the conflict and they in fact take center stage to determine the fate of these clans and the eventual future of Japan. In the game, you have three shuriken as your playing pieces. You put these in different places and immediately do the action on that space. 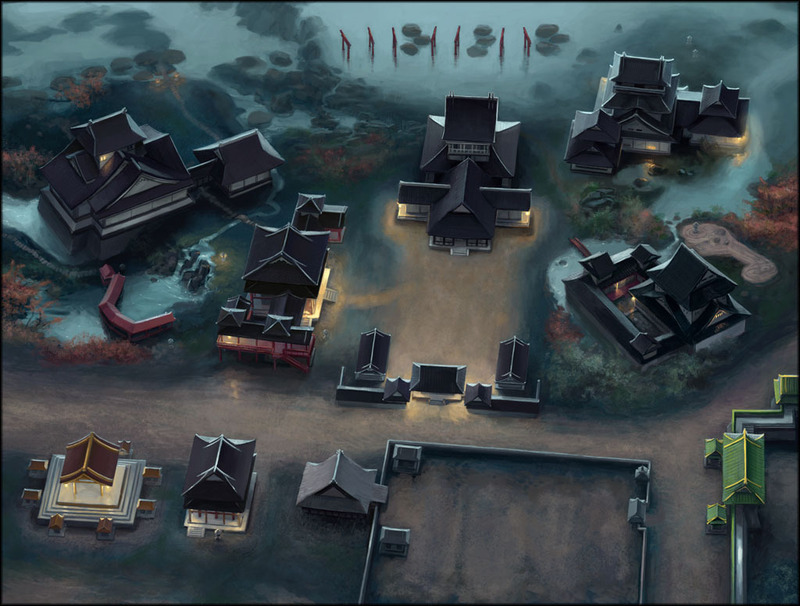 The entire board is a village – so you can place your shuriken in the dojo and take cards that represent your martial arts, at the Sensei to learn ninja skills such as explosives, espionage and disguise. Or you can invade a house to steal treasure – and this is the center of the action. After you collect treasure, you can give them to envoys of the clans at the palace to gain their influence or use them to spread rumors about yourself or opponents at the pavilion. The game only lasts 7 rounds, so you really need to use all your actions with absolutely no wasted movement. At the end of round 3, 5 and 7, there’s an opportunity to score honor. You get that by holding the majority of envoys in a clan. You collect honor from the houses. At the end of the game, the player with the most honor wins. I think the most original aspect of the game is the way invading houses works. You decide if you want to invade using strength – and so are going to attempt to play high cards to defeat the guards – or by stealth – and so play low cards to defeat the guards. As you go further and further in, you pick up treasures. At times, an alarm can sound and call in more guards – elite guards that are more difficult to defeat. So there’s this tense push your luck to the game. But if you’re well prepared from the dojo and with skills, you know your chances and can eliminate luck completely. But waiting too long allows your opponents to take action! Such is the life of a ninja – stealth, strength, patience, then decisive action. The neat thing here too is when you defeat all the guards in a house, you dishonor (remove honor) from the clan that held the house. And you increase the honor (add honor) to the house on behalf of another clan. So this is how the tension changes – you collect envoys in a clan, but then you have to support that clan by invading the opposing clan’s houses. It’s a very dynamic game and moves very quickly to the end game. It lasts about 60 minutes and supports 2, 3 or 4 players. How long has Ninjato been in production? How many iterations have you two seen during prototyping? The game started in June 2008, so nearly 3 years in the making. The iterations are numerous in this one – almost too many to count. 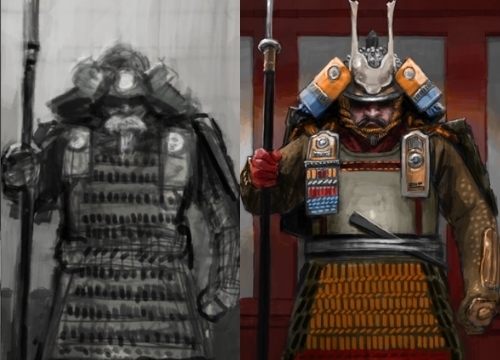 This game really changed during development – far more than our past game Galactic Emperor. Mainly this was because we were brutal in play testing. And also because although we knew approximately what we wanted to design, Ninjato started with important concepts, but not the mechanics. That was deliberate too – we wanted a game that was original and didn’t start with any mechanics that lasted to the end. Can you tell us about the changes in gameplay that have come about during playtesting and production? The theme of Japan and ninjas was there from inception, but little else made it to the final game. Originally, we had individual ninjas on a game board and opponents played against each other – both protecting and invading houses. The game had various phases – morning, dusk and night. Then we had a temple in the game, and a future of Japan track – and all kinds of things that didn’t make the final cut. The last change was getting component counts and ratios correct and a nice change hinted at by Zev (Shlasinger, founder of Z-Man Games) that changed the pace of collecting cards. Speaking of Zev, how did you get hooked up with him and Z-Man Games? We contacted Zev to get his opinion on manufacturing. We were planning to produce the game ourselves again like we did with Galactic Emperor. I sent Zev the rules – mainly just to get his opinion on costs, but he said it looked interesting and would be willing to take a look at it. We sent it along and waited a few weeks to get the play test report back. We were holding our breath – mainly because we thought we had a great game, but didn’t know if it was really good enough. It was a bit like handing in your thesis to a respected professor. You’ve spent a long time on it and know it’s your best stuff, but still, waiting for the final review and grade – that’s really hard. In the end, Zev said he’d do it. We couldn’t be more happy. The art and gameboard are very beautiful and elegant. From what influences did you and your designers – Drew Baker and Peter Gifford – draw? From the start, we were determined to treat ninjas with respect. We’re well aware of how campy ninjas usually are in all forms of media. We felt it was past time to bring some historical context and some level of realism to them. It felt like a place a board game had never gone and it made for an exciting design. Having a solid theme really makes a tremendous difference. Drew is well known from Legend of the Five Rings. Personally, there was nobody better for our game. Drew draws from photographs and did research on 12th century Japan extensively. He looked at buildings and clothing from period material or re-enactments. The game board was the most difficult because we wanted a dark look, but had to make it legible too. And it was Drew’s first game board! There were several Skype calls to get things worked out. We were reading historical accounts, books like Grass for His Pillow, and watching movies like the Seven Samurai (what a film!). Drew’s illustrations are far more than we thought possible – just a lovely work. Peter is a gifted graphic designer and brought a professional touch to every bit of the game. He established the feel for the game and brought consistency to all parts of it. What are some of your favorite games, both past and present? What games do you think directly influenced the development of Ninjato? We play all types of board games and have for many years. We knew the ‘weight’ of the game we were building and so looked for grand examples of that space. 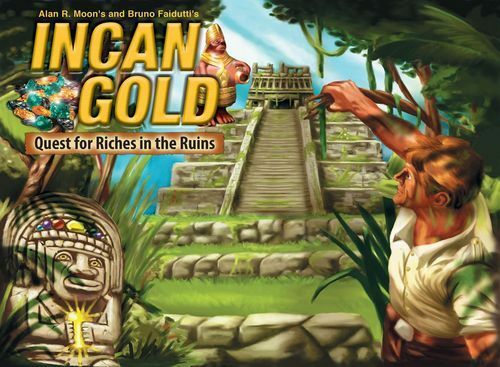 In the rulebook, we credit Brunnhofer and Tummelhofer’s Stone Age, the stress inducing push-your-luck in Faidutti and Moon’s Incan Gold, and the critical advance planning in Kramer and Ulrich’s The Princes of Florence. Maybe you can see some of the qualities from these amazing games that we’ve used in our design. We really believe in building on important designs of the past and that this advances the art of game design. We also believe we contributed to the design space in some important ways – especially in the dynamic of clans and the original use of cards to invade houses. Do either of you have other games in development? What can we look forward to in the future? We have several other designs in the works. We have a very thrilling design in the epic fantasy game space. This is a space that we’ve been in for many years with our computer game designs, and believe our experience and angle of attack is quite different in this arguably over-used genre. We also have a murder mystery game set in 1938 New York City in the works and an epic Euro that takes place over about 1000 years of history in ancient Athens. There are a few others in early design phase as well. What comes next from us depends largely on what plays well and what excites us in design. Since CrossCut Games is a veteran company – having designed and developed the very popular Galactic Emperor – what tricks and tips can you provide aspiring game designers in getting their games published? We don’t feel like veterans yet! We wish we had a set of reliable design principles that would lead from idea to solid game, but we’re still searching. The most important suggestion is to play test without mercy. The second most important is to play alot of games – and to understand what makes a game good. It’s important to tear down a game into its parts and learn why a designer chose to do what they did. It seems too many aspiring designers believe game design starts and stops with an exciting concept. Game design is instead a journey where you leave an exciting concept and find your way to a finished product. It is exhausting. 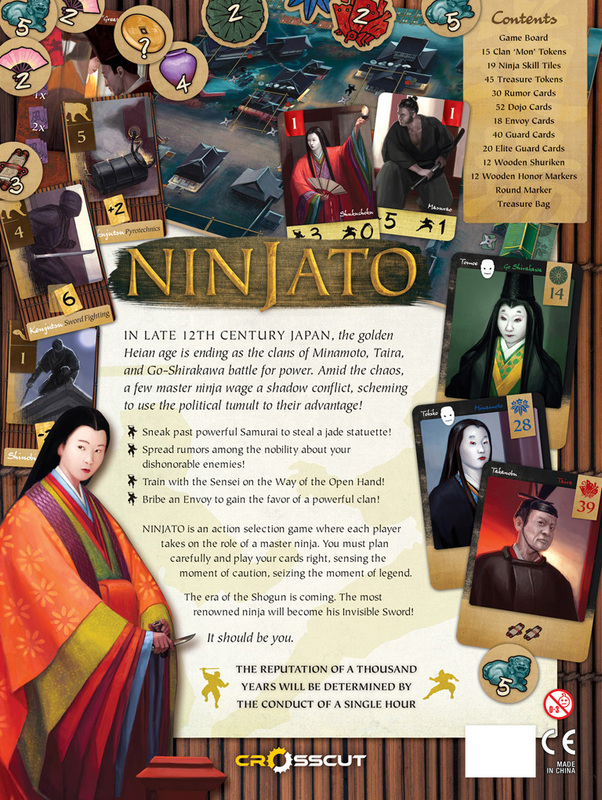 Ninjato is scheduled for a June release from Z-Man Games, and will retail for $49.99. 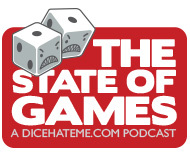 Be sure to watch Dice Hate Me for an upcoming review of Ninjato! The theme and artwork immediately drew me to this game, but after reading through the rules I realized it’s not just a pretty face. This looks to be a really fun and unique game. Can’t wait to get a copy! Oh and thanks for bringing in some ninjas…trolls were starting to take over around here. Nice interview. At first I thought you were interviewing the guys who created Ninjango for Lego. I was confused. But this is way better. The art is gorgeous and I’m interested to see how the invading mechanic works. I need to go read the rules. Tom – Hahahah Ninjago would be cool, too! I’ve read over the rules for Ninjato and they seem incredible and fun.